This Hubble Telescope image of the week shows the slow waltz of two brown dwarfs in Luhman 16AB. The observed system, Luhman 16AB, is only about six light-years away and is the third closest stellar system to Earth — after the triple star system Alpha Centauri and Barnard’s Star. 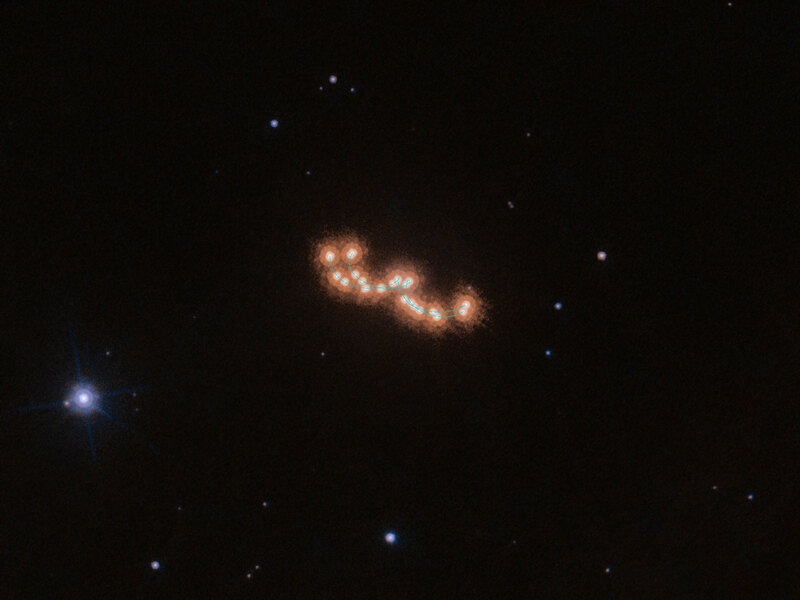 Despite its proximity, Luhman 16AB was only discovered in 2013 by the astronomer Kevin Luhman. The two brown dwarfs that make up the system, Luhman 16A and Luhman 16B, orbit each other at a distance of only three times the distance between the Earth and the Sun, and so these observations are a showcase for Hubble’s precision and high resolution. This video shows the two brown dwarfs from the Luhman 16AB system as they move both across the sky and around each other. The movement seen in this video occurred over the course of three years and was observed by the NASA/ESA Hubble Space Telescope. The researchers studied the system in the hope of finding a planetary companion. However, the movement of the two brown dwarfs indicated that they are indeed unperturbed by a massive planetary companion. The astronomers using Hubble to study Luhman 16AB were not only interested in the waltz of the two brown dwarfs, but were also searching for a third, invisible, dancing partner. Earlier observations with ESO’s Very Large Telescope indicated the presence of an exoplanet in the system. The team wanted to verify this claim by analyzing the movement of the brown dwarfs in great detail over a long period of time, but the Hubble data showed that the two dwarfs are indeed dancing alone, unperturbed by a massive planetary companion. Credit: ESA/Hubble & NASA, L. Bedin et al. Be the first to comment on "Hubble Views the Slow Waltz of Two Brown Dwarfs in Luhman 16AB"